Available in many sizes ranging from 8 tonnes to 115 tonnes the Sherwell Silo from Ahrens is transportable and designed with a low level or steeper cone. Designed by Sherwell to suit all different types of grain, the silo’s can also hold granulated fertiliser, pellets and legumes. The bases can be either orange painted or galvanised. Sealed silos are available in sizes from 47 tonnes to 155 tonnes and feature a ground open centre fill. With a featured oil relief valve along with a tubeless valve, this choice of silo is air tight and has a fully sealed roof. The wall sheets are double sealed and the filling and emptying points are rubber sealed. Dairy silos have a cone angle of either 45 or 60 degrees and too are available in a range of sizes. 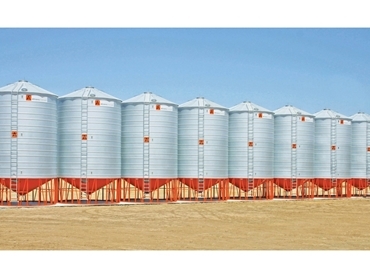 These silos feature bag shutes, blower tubes and vents and ground clearance can be varied.